I've complained in blogs about, well, almost everything, but lately one focus of my ire has been headphone amps. Everyone's coming out with one, and they're almost all the same: a headphone amp and a DAC chip stuffed into an extruded aluminum box. Whoop de doo. That's partly why I was so shocked when I was paging though a copy of JazzTimes and saw an ad for the Tube Head HA75 headphone amp: The HA75 actually has features I've never seen before--features that seemed like they might be useful. The other reason I was so shocked was the brand: Hafler, a marque I haven't seen used for perhaps a decade. Hafler--the creation of the late audio engineer David Hafler--was famous for co-founding Dynaco, for Hafler-branded power amplifiers used in professional and audiophile systems, and for the Hafler matrix, a simple, passive surround sound system that predates Dolby Surround. The Hafler name has now been acquired by Radial Engineering, a Vancouver, BC, company best known for making direct boxes--devices that interface musical instruments with P.A. systems and studio gear. I happened to be at Innovative Audio in Surrey, BC, when the guys from Radial stopped by to do a demo a mere two hours after the first production-model HA75s came off the company's Canadian production line. As luck would have it, I ended up being the first journalist to give the HA75 a serious listen. What's so special about the $999 Tube Head HA75? Almost everything. It's a hybrid design with a 12AX7 tube for the input stage and a solid-state (transistor) output stage. The global feedback--the amount of signal from the output stage that's fed back into the input stage to cancel distortion--is adjustable from the Feedback knob on the front panel. A Focus knob blends L+R (an equal mix of left and right channels) into the left and right channels to provide a more solid and focused center image. A Loudness switch provides a boost to bass and treble when the volume is set at lower levels; it can be set for the classic Fletcher-Munson loudness curve or a more extreme version with more bass boost. 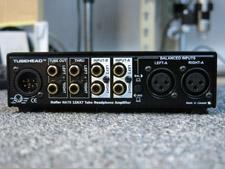 The HA75 offers two inputs; input 1 can be switched between XLR and RCA inputs. It also has a loop-through output that sends the input signal back out and a line-level output that lets you use it as a tube preamp. Two quarter-inch headphone outputs are provided; there's no provision for balanced headphone output. A separate power supply, attached through a five-pin XLR connector, is included. I tested the HA75 using HiFiMan HE-560 planar magnetic, open-back headphones, and I fed it signals from an Aurender Flow USB headphone amp/DAC used in two-volt, fixed-level output mode so that it functions like a DAC instead of a headphone amp. For me, the Focus control proved the most useful of the HA75's special features. Blending L+R into the left and right channels is no great technical feat, and I have to think someone's done this before, but still I loved the effect once I tried it. It helped get away from that "sound coming from each ear" effect I normally hear from headphones, with none of the phasiness and other sonic downsides that often occur with crosstalk cancellation and HRTF processing circuits. On recordings with a big, reverberant sound, such as Jeff Beck's version of "Rollin' and Tumblin'" from You Had It Coming, setting the Focus control at 12:00 (straight up) gave the big, out-of-phase guitar hits at the end of each vocal phrase an added kick that I loved. Of course, some of the spaciousness was lost, but I thought the overall effect was more satisfying than the unprocessed sound. Likewise, Michael Brecker's "Song for Bilbao" from Tales of the Hudson--a big-sounding jazz arrangement with multiple horns--came into better focus with the Focus control set in the 11:00 position. The Loudness switch also had positive effects. It functioned just as it's supposed to: its effect increases as you lower the volume. With the HA75's volume set to 11:00, the upright bass notes in Holly Cole Trio's version of "If I Were a Bell" from Blame It on My Youth seemed to be at about the right level with the switch in the B setting (classic Fletcher-Munson curve); with the Loudness switch off, the sound was too thin. In the A setting, with the added bass boost, it sounded like the bass player put his amp closer to the wall; there was a nice added heft. The downside of this is that you need different volume settings with different headphones and different music, so the Loudness switch won't work consistently. I wonder if a three-position bass boost switch might be more useful. The Feedback knob also affects gain, so you have to adjust Feedback and Volume together to keep the level consistent. (You can use the Feedback knob's gain-control function to help get better results from the Loudness switch, too.) This is the one special feature of the HA75 that I didn't find all that useful. To my ears, reducing the feedback just increased distortion, without introducing any of the marvelous sonic majick I've been told occurs when feedback is reduced. At $999, the HA75 is far from inexpensive, but popping the top revealed a forest of high-quality components: top-of-the-line Japanese capacitors, one-percent metal-film resistors, etc. The one thing that's really missing is an internal DAC, but the company expects to introduce a DAC-equipped model very soon, along with a less-expensive headphone amp, a couple of phono preamps, and eventually some power amps. • The HA75 has a highly useful Focus control. • The hybrid design offers plenty of power for hard-to-drive headphones. • The Loudness switch is useful, but very dependent on headphone sensitivity. • The Feedback knob isn't all that useful. • The HA75 lacks a DAC and balanced output. 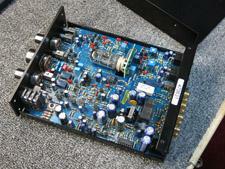 There are lots of headphone amps around $1,000, many with built-in DACs. For $1,199, there's the Oppo Digital HA-1, which includes an advanced DAC, Bluetooth, remote control, and balanced headphone output; it's almost the opposite of the HA75, which is a comparatively old-school design. For a more straightforward solid-state design, there's the $999 Burson Soloist, a DAC-less design with a stepped-resistor volume control, a feature commonly found only on ultra-high-end preamps. On the tube side, there's also the $999 Woo Audio WA7 Fireflies, which includes a DAC and looks about as cool as a headphone amp can. The WA7 is a pure tube design, not a transistor/tube hybrid like the HA75. It's clear that the Tube Head HA75 faces ample (and more technically advanced) competition, but there's no denying that the HA75 is distinctively different from anything else on the market...and the price is in line with its build quality. I'll be curious to see if its unusual features catch on with headphone enthusiasts.